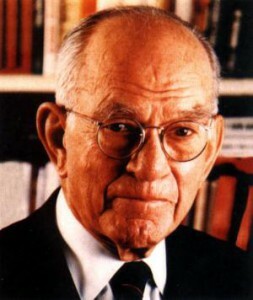 William Fulbright was born on April 9, in Sumner, Missouri in 1905. He was raised and educated in Arkansas, and had never seen a major American city before he received a Rhodes Scholarship in 1925 to study in the University of Oxford in England. He later attended the George Washington University Law School in Washington, D.C. In 1934 he served as a special attorney in the US Department of Justice for a year. He later went on to becoming a lecturer at the George Washington University from 1935 to 1936 and then at the University of Arkansas from 1936 to 1939. He became the president of the University of Arkansas and served his term from 1939 to 1941, being the youngest serving university president in the country. Fulbright was elected to the US House of Representatives in 1942 and later to the US Senate in 1944. He witnessed a world devastated by World War II. Awed by the overwhelming destructive capacity of atomic power, Fulbright drew upon his overseas experience during his student years. It was in fact his three-year experience at Oxford and his travels in Europe that provided him with insight about the importance of relating to people by seeing the world through each other’s eyes and national experiences. Overwhelmed with the desire to see the United States as a source for peace, and not just war, he pioneered a program which was ingenious in its mechanics and far-reaching in its impact on hearts and minds. Fulbright’s plan was to fund the academic exchange of young Americans and foreign nationals through the sale of surplus war materiel left behind in Europe and the Pacific. He was able to gain Congressional support for the plan by tacking the program onto other, unrelated legislation. As it required no funding initially, Congress gave its imprimatur. Of course, this opened the door for a funded program in later years as the sales of war surpluses dried up. Fulbright’s enduring legacy will be simply that he believed that people might develop a capacity for empathy by living and studying in other countries; that this would help them develop a distaste for killing other men and, in turn incline them more to peace. It was this simple concept which brought about the core and foundation of the exchange program that later became one of the most successful components of US foreign policy. Having survived the vicissitudes of partisan politics and even attacks by Senator Joe McCarthy’s red scare, the Fulbright-Hays Act continues to provide funds for the exchange of students, scholars, and teachers between the United States and other countries around the world. Fulbright continued being an influential senator and became a leading critic of the US foreign policy before his resignation from the US Senate in 1974. His writings include Old Myth and New Realities (1964) and The Arrogance of Power (1967).